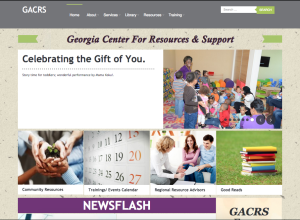 The Georgia Center for Resources and Support (GACRS) was designed in 2001 by the Georgia Division of Family and Children Services to assist in strengthening Georgia’s adoptive and foster families. It is managed by Families First. The purpose of the Georgia Center is to provide a central resource for adoptive parents to help them locate resources that can help them be successful in meeting the needs of their adopted children. On July 1, 2004, GACRS expanded its services to meet the needs of both adoptive and foster families who reside in the state of Georgia. GACRS administrative office and library are located at 1105 West Peachtree St. NE in Atlanta. Regional Resource Advisors are located in communities throughout the state and are available to help families clarify their needs, locate resources and feel supported as they resolve concerns encountered as an adoptive and/or foster care family. GACRS cooperates with and coordinates referrals to many resources throughout the state. It is a non-profit organization and services are offered at no charge to all adoptive and foster families living in Georgia. Adoptive families who reside in Georgia can utilize GACRS services regardless of the origin of their adoption.